Here’s the boy again, posing for the camera. This one was taken at the top of the steps into the bay at Durdle Door. If I recall correctly, there were quite a few onlookers to this photo who either clucked and coo’ed at the cute dog, or took a wide detour to avoid the big ginger menace (and no, he’s not really that big!) After this photo we went off-road and ran down the side of the steep steps and avoided a long, very slow walk behind all the families. 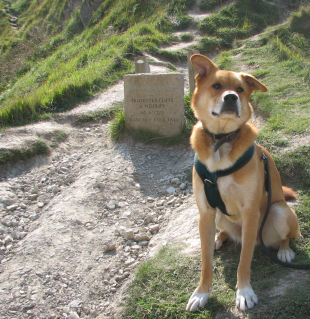 Although his ears are at ten-to-two, you will find that Theo is constantly alert to danger, and to the next opportunity to look dolefully at tourists who may wish to share their snacks and ice-creams.. Forget the Eggs, Chase the Easter Bunny!